To say that 2016 was a year of change for me would be an incredible understatement. After ten years working in higher education, running professional art galleries, I decided to leave my job and find my bliss. Last night Andrea and I dropped in on a yoga class at our old favorite, South Windsor Yoga Studio. Back about a hundred years ago we were SWYS regulars. We both went for a few years and then things happened, we both got married, one of us had babies, and we both stopped going. Andrea had been going to SWYS on and off, but I hadn’t been there since… hmm, probably since 2000, maybe 1999. Long time. We sort of both lost track of our class at Lotus Yoga. As much as we liked it, the day wasn’t working and we wanted something different so when Andrea suggested we drop in at SWYS on Monday night, I said sure. And all I can say is that it was like going home. Honestly, it was surreal. The studio has changed very little, and Paul and Sydney, the couple who own the studio, they’re still teaching the classes. For me the sound of Paul’s voice, the flow of the postures, the method, the whole thing, it was like having deja vu for an hour and a half. It was wonderful. My brain stopped, my body relaxed, and I enjoyed every second I was there. We both floated out to the car and then, if we weren’t happy enough already, we stopped at Rita’s on the way home. I got a mango ice with vanilla custard and ‘Nilla Wafer Blendini and… yum. Unfortunately I was expecting to be blown away by some amazing, fabulous, never before experienced ice cream glory based on the things I’d heard people say about Rita’s, and because of that I was a little disappointed. It was good, don’t get me wrong, and I’d leave the computer right now to go get another one if you asked me to, but if you offered me a Blizzard from Dairy Queen or a Blendini from Rita’s, I’d have to take the Blizzard. We took our not-Blizzards-but-still-yummy Blendinis home to Andrea’s where we sat on the couch and watched Dancing with the Stars together. It was delightful. Next week we plan to do the same. I’m not sure if we’ll go to Rita’s, but I guarantee there will be ice cream in there somewhere. Then we’ll watch the final DWTS of the season and one of us (or both of us) will cry because she’s rooting for Jason and I’m rooting for Christian. At least there will be ice cream. Really I’m just trying to come up with an excuse why I haven’t scanned my drawings yet. I think it’s Andrea’s fault. Tonight, I promise I’ll have them scanned and up on Flickr. 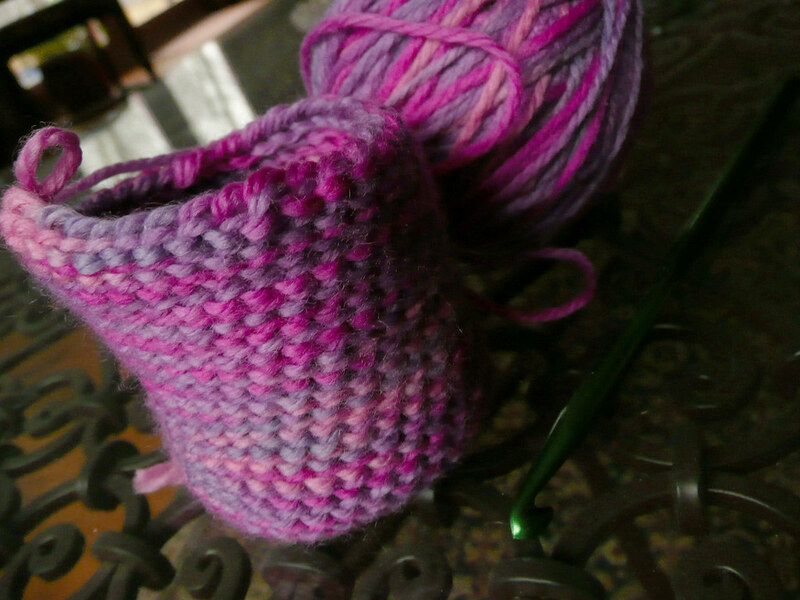 In the meantime, check out the cute mug-to-be that I’m crocheting. I saw the idea on someone’s blog last week and now I can’t remember who it was. Oh well, thank you brilliant blogger lady whoever you are. It’s cute, isn’t it? If I don’t get dragged out and forced to shop again tonight I should be able to put the handle on and finish it (after I scan my drawings, of course) and maybe even have a picture of it for you tomorrow. Oh the excitement.